Work is carrying on apace at the site (click the photo to see a larger image). The dramatic CBD backdrop means that the refurbished dwellings will attract a premium price. The fact that well-known conservation architect Robert Riddel has been engaged for the project will help too. What an amazing piece of architecture. And great that it has been renovated and saved. 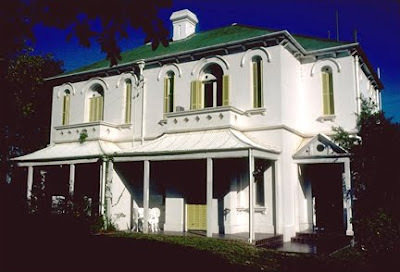 The Australian colonial veranda has the slight feel of a Chinese pagoda; the pillars look to be squared off timber (rare in 1867, I would have thought), the windows are narrow and rounded at the top yet they have Mediterranean-type shutters, and it looks as if there are two balconies over the veranda. Was the chimney functional? If so, that is an interesting location. My paternal grandparents lived here [in the RH side, lower half] until the death of my grandfather in 1959. A Mrs Hetherington lived above them and I believe she owned that half. Her late husband had been I'm told Brisbane Town Clerk. Yes, the chimney was functional, and I believe it was positioned centrally for use from both sides of the building. My mother lived two doors up and I remember her telling me as a child about the daughter of the occupants of the LH side during WW2. Apparently she was in a relationship with an American serviceman who had deserted and he was living there with her family. Military Police often raided the house but he was never caught as he would hide in the cellar, which they didn't know about. Whatever happened after the war finished I do not know. I spent a lot of time there but never saw evidence of a cellar on my grandparents side, although I remember the place vividly. I'd love to revisit if the present owners approved. The building has always been two residences. In my photo you can see the dividing fence separating the two yards, and the houses are split on the same plane - they are mirror images - hence the two balconies. I wondered whether the positioning of the chimney results from the same reason - could there be two chimneys combined? In fact there is a second chimney at the rear of the building, not visible in either photograph, and it is also positioned centrally. The houses originally had kitchens at the rear, and so the kitchens may have had chimneys as well as the lounge rooms.